The VFW in Gardiner Montana greeted my first wearing of cowboy boots, borrowed from Pete. A memorable small-town wedding made unforgettable from a new vantage point, 2″ higher. A few decades later, horseback riding occasioned buying a pair of these useful boots. Not until venturing into Saba’s to duck ovenlike temperatures of Scottsdale in August did my knowledge come full circle. Within this establishment resides the former general manager of Saba’s Western Wear, selling, educating, and enjoying the people who make up the boot chain’s success. Three days a week the spry and smiling Jerry Hill brings it all together for hundreds of clients. 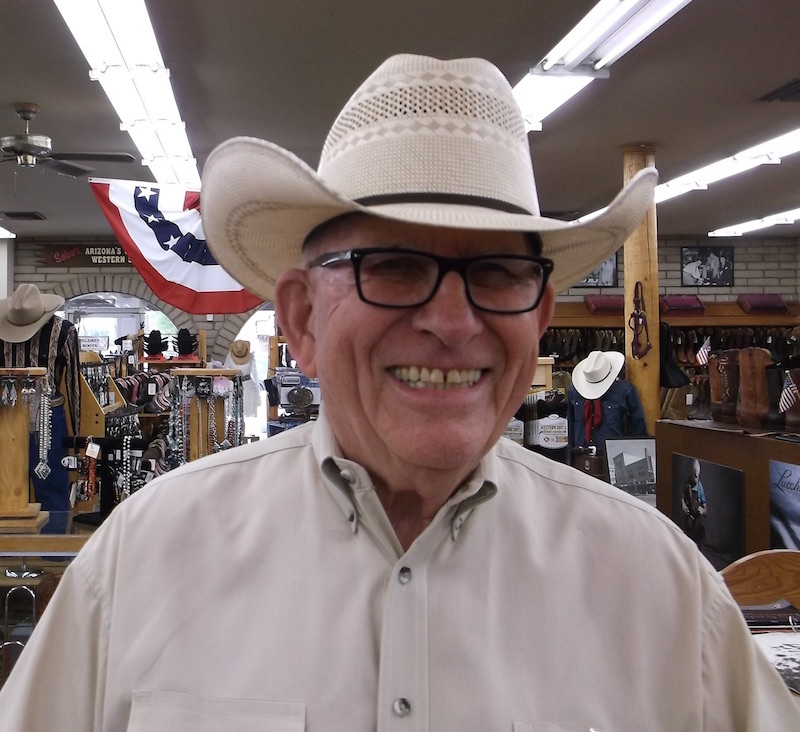 His understanding of the American boot history, materials, tanning, construction, and especially fitting, make every browsing experience remarkable. Handmade vs handcrafted finally understood, my favorite boots are about the same price as a decent pair of Aldens. “Handcrafted means I had a machine assisting me in doing some things in building this boot … a handmade boot is unique in its own right.” Ask Jerry about lemonwood pegs, 1880s-style! What is Saba’s known for? Fitting boots, shaping hats, and the quality of the merchandise. Shaping hats? Yes sir. The hat is easy to fit us if certain things are covered. A thumb high above my ear and a finger above my eyebrow. I don’t want to be Deputy Dawg but I don’t want it touching my ear either. And then across the eyebrow? That’s a cowboy thing, a little social thing. No man can see what I’m looking at unless I want him to see my eyes. This entry was posted in Product Review and tagged american made cowboy boots, handcrafted vs handmade, jerry hill saba's, peter burr folks.